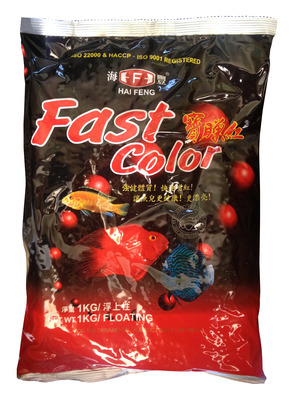 Developed to enhance the colour quickly.� It can enhance the colour of most fishes to bright and beautiful colours. Also good to gain the colour back when the fish colour is fading to changes in the water. Special immune substance and Vitamin A, C, E, enzymes and other important elements are added to ensure balanced growth and�disease resistance. Ingredients: White Fish meal, Soybean meal, Wheat Flour,�Dried yeast, Krill, Barley, Fish Protein, Shrimp paste, Natural Immunoglobulin, Protease, Minerals, Vitamins, Natural Colour. 1.5mm colour enhancing small floating pellet (H656A). 3mm colour enhancing medium floating pellet (H670A).